Make your cast-iron skillet last a lifetime by seasoning and cleaning it properly. A cast-iron skillet can be used to cook on the stovetop, the oven or the grill. A good iron skillet can be passed down as an heirloom if taken care of properly. Show your cast-iron cookware a little TLC and pass it down through your family’s generations to come! Traditional cast-iron skillets do not emerge from the box with a non stick surface. Seasoning is the process of making your cast iron non-stick, a technique which defends against wear. You will need a cast-iron skillet, vegetable shortening, heavy paper towels, mild soap, warm water, and an oven. Seasoning and re-seasoning a new skillet are performed the same, with the exception of the first step. First, wash your new skillet in warm water with mild detergent. This removes the factory anti-rust coating. If you are re-seasoning a skillet, be sure to wipe the entire surface with hot water and a clean wash cloth or paper towel. After you have washed your skillet, dry it by heating it on the stove top. When the pan has dried allow it to cool. While the skillet is cooling, pre-heat your oven to 200 degrees. When the skillet has cooled completely place a dollop of shortening inside. A 10” skillet usually requires about 1/4th of a cup shortening to thoroughly coat the skillet. More can be added as required to cover the skillet entirely. Fold the paper towel once down the center, then again horizontally. Then take the paper towel and coat the interior and the exterior down to the bottom edge and the handle liberally. Do not coat the bottom of the skillet because it will produce smoke on any cook surface that it touches as it burns off the shortening. Once you have thoroughly coated the skillet, place it in the oven at 200 degrees. Set your timer for three hours. Seasoning your skillet at this low temperature allows the cast-iron pores to expand and the shortening to penetrate as it liquefies. After three hours, remove your skillet from the oven and allow it to cool. Once the skillet is cool enough to touch, wipe it down with another paper towel in order to remove most of the shortening, leaving a thin coat on the surfaces. After about an hour has passed, wipe the skillet down again. After this final wipe you will be able to tell a noticeable look and feel in your skillet. Now you are ready to use your skillet! For the first couple of uses plan on cooking something greasy like bacon or sausage. This will help to heat cycle and re-coat the interior surface which will make the non-stick coating better. Also, be prepared for your skillet to smoke the first couple of times you use it after seasoning, as it heat cycles and burns off the water trapped in the pores and the excess lard. Maintain you cast-iron skillet by wiping the interior every couple of months with bacon grease during a heat cycle or cooking something greasy. Re-season about every 2 years following the process above for best results. Never allow food to sit in the skillet as this will remove the seasoning and wash the skillet out using very mild soap and warm water. NEVER wash your cast-iron skillet in the dishwater. Doing so will remove the seasoning layer. After each use wash then dry your cast-iron skillet on the stove top. Turn the burner on high and place the wet skill on it for about a minute. This process will heat the skillet up enough to dry the water and heat cycle the pores, keeping everything about your skillet as it should be. There is only one thing you should not attempt in cast-iron cookware- boiling water. Boiling water will cause the pan to rust. Other than that, cast-iron cooking is good for anything you have a craving for, be it peach cobbler, homemade biscuits or soup. Cast iron takes longer to warm than other surfaces, however, it retains heat remarkably well and diffuses it evenly. It also remains hot long after it is removed from the heat source. Cooking in cast-iron also increases iron content in food. The longer the food is in contact with the cast-iron the more iron it absorbs. Jefferson- Organized by the Steampunk Illumination Society, and hosted by Marquis of Vaudeville, this three day event is set to take place from March 30, 2012 – April 1, 2012 in Jefferson, Texas. We will be delving into the world of paranormal and Steampunk together in one hauntingly spectacular event. Join us for journeys through ghostly lands as we ride steam trains, steam boats, horse drawn carriages, venture through museums, visit historical sites, patron antique shops, dance to fantastical music and so much more! We invite everyone, young and old, to join us in this one-of-a-kind convention that doesn’t aim to take over a single building, but an entire city that is known for it’s ghostly inhabitants and spectacular haunts. 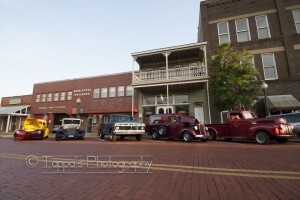 Nacogdoches – The East Texas Classic Car Club will be hosting their first Friday cruise night on the red brick streets of historic downtown Nacogdoches on Friday, July 6, 2012. The cruise will take place from 6 to 8 p.m. on the back side of the Convention Visitor’s Bureau along Pilar Street. Anyone interested in displaying or talking about their vehicles is welcome to attend. That is an interesting way to do it. I seasoned my trusty skillet (frying pan as we call it here in Ireland) by washing first to remove the anti rust, heating on the gas, cooling, heating again to pretty hot (when the handle gets hot), wiping with oiled paper towel (vegetable oil). Repeat the cool, heat, oil, cool cycle a couple of times. I did that about 12 years ago and it has served me well ever since. I did the same method with my trusty steel wok about 20 years ago too. I usually believe that one has to spend a lot to get a decent saucepan but in the case of the skillet and wok, both were as cheap as chips and excellent long term value.